Parafield Aerodrome commenced as the main Adelaide Airport in 1927 and remained as the main Adelaide airport until the new West Beach Airport became Adelaide Airport in 1955. The article follows some history of Parafield with particular reference to its early radio communications and radio navigation facilities while it was Adelaide Airport. First published in the December, 2016 issue of "Aviation Heritage", the journal of the Aviation Historical Society of Australia. As can be seen from the long reference list at the end, there is a lot written about the Parafield Airport. However it is difficult to find much detail of the facilities and equipment that has been located at the airport to provide radio communications and navigation aids. The initial aim was to fill that omission and describe facilities and equipment that was used, particularly in the earlier years. Rather than describe just the technical details in isolation, it seemed to the writer, that it would be better to write within a bigger picture of the general operation of the airport..
With this in mind, some basic history has been included about the start of the aerodrome and some of the resident operators. These include the Aero Club, the 1929 Air Race, the RAAF Flying Training School, the Department of Aircraft Production (DAP), Guinea Airways and elements of the Department of Civil Aviation (DCA), such as the Region Radio Workshop and the Technicians Training School. Much of the general information has been compiled with the aid of the references listed at the end. However, details of the radio facilities follow from personal knowledge of the writer. In the 1940's, the writer was employed in the Transmission Section of the PMG's Dept. Much of the work function of that section included installation of Aeradio Station equipment for DCA in aerodromes within SA and NT. In the 1950s, the writer took up appointment within DCA itself, firstly supervising radio installations and later supervising the Regional Radio Workshop at Parafield. Information on some of the very early installation of radio communication equipment by Amalgamated Wireless has been tracked from the book by John F Ross (Ref. 2) and photos of the general Parafield scene are a few from the many collected and displayed by Geoff Goodall, air traffic controller for 45 years and others. Vetting of some of the very early aviation history has been carried out by historians of the South Australian Aviation Museum with further scrutiny in publishing by the "Aviation Heritage" journal. Parafield airport started in 1927 with the purchase of a farming property of 318 acres (129 ha) at Parafield . Ground preparation was completed on the 17th of October that year. (The boundaries, of what became the new airport, were later expanded in 1942, with an extension west to the Gawler railway line). On October 1, 1927 Parafield Airport opened after Albert Park Airport had closed the day before. It was first used as an aerodrome on that day, when the Commercial Aviation Company (later the Western Australian MacRobertson Miller Airways) and the Australian Aerial Services, moved from the aerodrome at Albert Park. 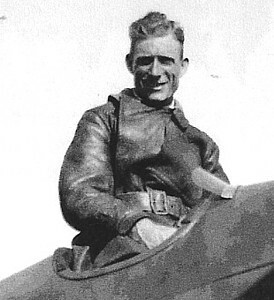 Pilot H. C. "Horrie" Miller was the first to land on the Parafield site. On May 29, 1929, a De Havilland Hercules DH66 Hercules aircraft, carrying 14 passengers, arrived at Parafield from Perth on the inaugural flight of the East-West Service. The service was started by West Australia Airways, founded by veteran pilot Norman Brearley (later Sir Norman). The airline is believed to have started Australia's first scheduled air service. The formation of the Australian Federation of Aero Clubs goes back to the 1914 era. It was initially known as the Aero Club of Australia. In 1929 it became the Associated Aero Clubs of Australia. In 1948 it changed its name to Aero Club Federation of Australia. Finally, in 1960, it became the Royal Federation of Aero Clubs of Australia. On 23 August 1926 a preliminary meeting of the Australian Federation (SA section) was held to discuss the formation of The Aero Club of SA. Captain E C Johnston, Superintendent of Aerodromes, Civil Aviation Board, Department of Defence, was present. An inaugural meeting was held on 22 September 1926 with around one hundred persons in attendance. By the following month there were one hundred and fifty financial members. Later that year the club received approval from the Defence Department for the loan of two DH60 Cirrus Moth aircraft. 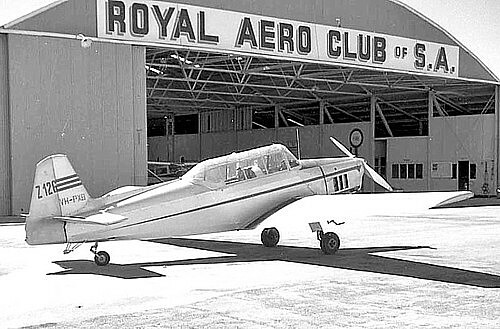 By November, the Royal Aero Club of South Australia had built a hanger at Parafield, and bought two aircraft for passenger and training purposes. Flights by the Aero Club began that month. On 26 November, 1927, an airshow was held at Parafield to celebrate the official opening of the South Australian section of the Australian Aero Club. A crowd, estimated between 25,000 and 30,000, were in attendance. There were fifteen aeroplanes present, including three Royal Aircraft Factory SE5A, and three DH9. The "Royal" prefix has been granted to the Australian Federation of Aero Clubs and its member clubs by the reigning King or Queen. It is believed that the decree was granted to the Royal Aero Club of SA in 1935. Parafield has retained its function as an airport for small aircraft and the Royal Aero Club of South Australia has continued as a training ground for new pilots. In 1929, an air race from Sydney to Perth was set up to commemorate the Western Australia Centenary. The race (also known as the East-West Air Race) covered a distance of 2,450 miles (3,940 km). The 17 teams left from Mascot aerodrome in Sydney on September 29, 1929. 16 of the aircraft landed at Parafield Aerodrome on October 1 and 14 managed to finish at Maylands Aerodrome in Perth on Sunday 7 October. For some years before the World War 2, the RAAF Reserve had attracted amateur radio operators including those in South Australia. One such radio amateur was Dougall Whitburn VK5BY. In 1929, the aeradio facilities set up in later years had not been established and radio control was clearly needed to control the air race. So the RAAF Reserve of radio amateurs in all of the States were engaged to provide radio control of the air race. Doug Whitburn provided the facility which, in progressive years, became the function of Parafield Aeradio. Because it was difficult to shift his radio gear to Parafield, he operated the Parafield link from his home. This was the first public performance of the newly formed RAAF Wireless Reserve, to prove to the Government and the Air Force, that the radio amateurs in the Reserve could become an extremely important cog in the machinery of national defence. The race aircraft were led by a Civil Aviation De Haviland DH50 aircraft fitted with a crystal controlled transmitter working on three channels around 41 metres. The race aircraft were followed by an RAAF Westland Wapiti aeroplane fitted with a self excited transmitter developed by Flight Lieutenant H K Love for general use on RAAF aircraft. Guard stations were provided in each State on the race route to communicate with these aircraft and other control stations. A guard station was also provided in Tasmania to relay information where difficulty occurred over short distance hops. Special mention was made of Doug. Whitburn VK5BY, who was the controller of the South Australian guard station VK5BY. Doug was in charge of the biggest and most difficult section of the overland flight from Parafield (Adelaide) to Kalgoorlie. Doug also coordinated the total of 60,000 words handled by the 20 RAAF Reserve of radio amateurs in all the States. Working single-handed, he used two receivers at one stage. He listened with one earpiece to the interstate station at Nhill and used the other earpiece to search for signals from the many other sources. Two specific channels were used, one on a wavelength of 23 metres and another on a wavelength of 42 metres. The signals sent by VK5BY were also enhanced by information Doug continuously obtained from the Adelaide Weather Bureau. Doug devoted 100 hours to the cause, working single-handed during the six day Sydney to Perth race. The race handicap winner of £1000 was Horatio (Horrie) Miller (Photo 4) in a DH9 . Mr. Miller became well known as the co-founder of MacRobertson Miller Airlines. 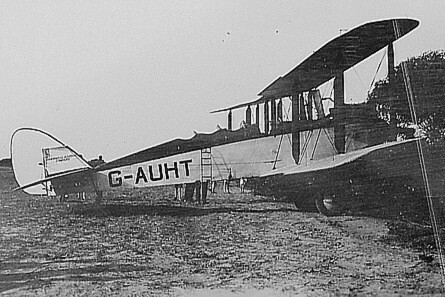 The prize of £300, for fastest overall time (22 hours, 50 minutes, & 23 seconds), was won by Hereward De Havilland in a modified de Havilland DH.60 Moth ("The Black Hawk"). He flew the course solo, the only competitor to do so and also came second on handicap. Hereward was the younger brother of Geoffrey De Havilland, British aviation pioneer and aircraft engineer. The RAAF occupied Parafield as an Elementary Flying Training School (No.1 EFTS) between 1940 and 1944. Training aircraft used were mainly the De Havilland Tiger Moth. The RAAF occupation of Parafield started on July 22, 1940 when the aircraft were brought in and the hangars occupied. The school operated an interim RAAF training programme that started on January 8, 1940 with the first course graduation on March 1, 1940. Parafield airport was also an important link in the supply chain to the operational bases in the Northern Territory and Western Australia, with No 34 Squadron operating a courier service from Parafield between 1943 and February 1945. The RAAF had their own Parafield radio operations during the war years. According to the John F Ross book (Ref. 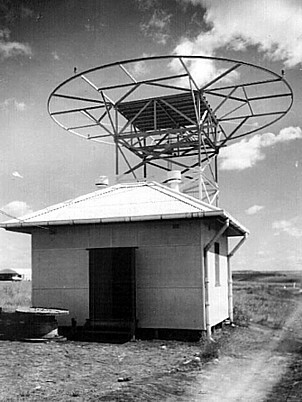 2), the first radio facility for RAAF at Parafield was called the Adelaide Wireless Telegraph Station. It was placed in operation on March 1, 1942 under the control of Sergeant K.S.Martin. The first RAAF equipment included AR7 receivers and AT13 transmitters. AT8 transmitters were installed in November of the same year and further additions of AT14 transmitters in July 1943. It is thought that the RAAF transmitters were installed in the DCA transmitter building on the other side of the railway line. The RAAF transmitters were three of a number of types which went into production to supply the armed services during World War 2. 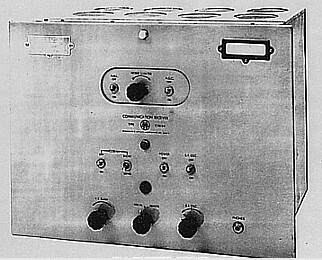 The AT13, manufactured by AWA, was a Continous Wave (CW) unit with 500 watts output capabiliy on 2.5 to 20 MHz. The AT8 , manufactured by Standard Telephones & Cables (STC), was also a CW unit with 500 watts capability on 3 to 20 MHz. The AT14, manufactured by Thom & Smith, operated on both CW and Radio Telephony (RT) with a range of 100 to 200 watts output on 3 to 20 MHz. At some stage, well known amateur operator Joe Kilgariff VK5JT (as an RAAF Flight Sergeant) was in charge of operations at the Parafield RAAF radio station and passed messages between Parafield and other RAAF stations at Laverton and Point Cook. One can guess that Joe used those CW transmitters for the Point-to-point operations. 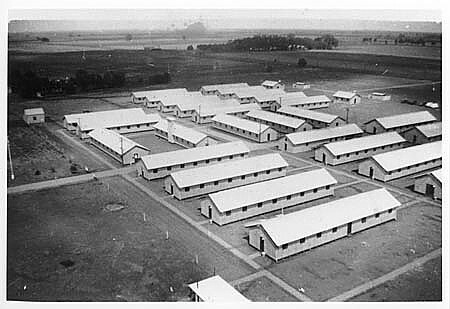 By 1945, the RAAF personnel had left and DCA made use of the multitude of huts which were left behind. It appears that DCA also made use of the RAAF transmitters left behind. According to a Geoff Goodall report, some of the RAAF huts were also later used for storage by the Royal Aero Club, Rossair, and Robbys Aerial Services. There was also a connection with the British RAF. From July to December, 1945, No 238 RAF Squadron was based at Parafield and flew Dakota aircraft in support of the British Pacific Fleet as part of No. 300 Group RAF. Radio Communications and Radio Navagation facilities. The first radio communications for Parafield were set up early in 1937 when Amalgamated Wireless Australasia (AWA) established communications to allow an operator at Parafield to communicate with aircraft via MF and HF channels. To do this, a transmitter at the Coastal Radio Station (VIA) at Rosewater was linked to Parafield. For receiving, communication receivers were set up in a small hut near the south west of the airport. An AWA manufactured Bellini Tosi type Direction Finding (DF) receiver was also set up in the hut. The new Department of Civil Aviation (DCA) was created on November 1938. But it wasn't until 1947 when DCA had sufficient staff to carry out their own radio communication and radio navigation installations. The early radio installations for DCA were the work of AWA. But between 1939 and 1947, the technical staff of the Transmission Section of the PMG's Department in Adelaide, carried out a major proportion of DCA radio installations in South Australia and the Northern Territory. (Ref. 12). In 1939, AWA installed Parafield Aeradio control in an Air Traffic Control Tower and installed the associated AWA J2876 transmitter. The 400 watt transmitter was housed in a building to the west of the aerodrome on the other side of the railway tracks and fed antennas supported by two 50 metre galvanised steel towers. For HF channels, dipoles were hung at favoured heights to suit the radiation angle and were delta fed via 600 ohm open wire lines. The J2876 (Photo 9) was a wide-frequency range 4 channel transmitter with common modulated amplifier. It was equipped with three HF channels and one MF channel. Each channel had a separate RF power amplifier output stage. Each channel was remotely selected by dialling a code on a telephone dial. This stepped a Strowger bi-motional switch which selected appropriate relays to operate the appropriate RF channel in the transmitter. The transmitter was connected via land line to the aeradio control centre. For receiving, AWA rack mounted communications receivers type C2869 were provided in the Air Traffic Control Tower. The 10 valve receivers were equipped with two crystal locked coil boxes and a tunable coil box for HF coverage (1.4 to 5mhz). The AWA DF receiver, intially installed at the hut, was also moved to aeradio control in the Tower. 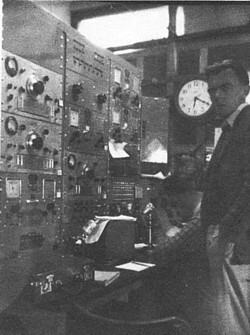 Later (around 1945), staff from the PMG's Department, Eric Manoel and Lloyd Butler, installed a key switching system at Parafield Aeradio to provide faster control of the J2876 RF channel switching. This was superimposed on the line pair which fed speech to the remote transmitter for modulation. The switching was achieved with a system of polarised relay and marginal relay circuitry. 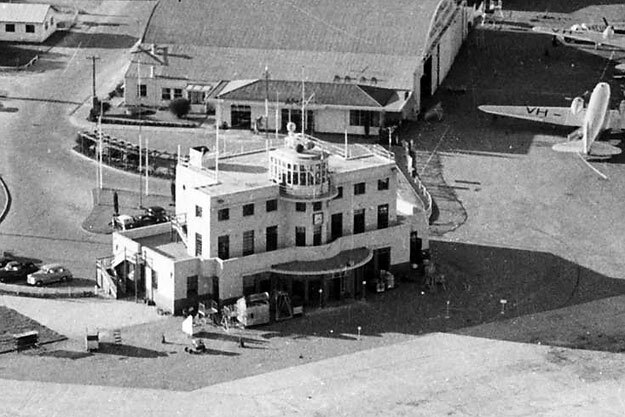 The new Parafield Control Tower (Photo 8) was built over the 1939-1940 period with completion in that later year. 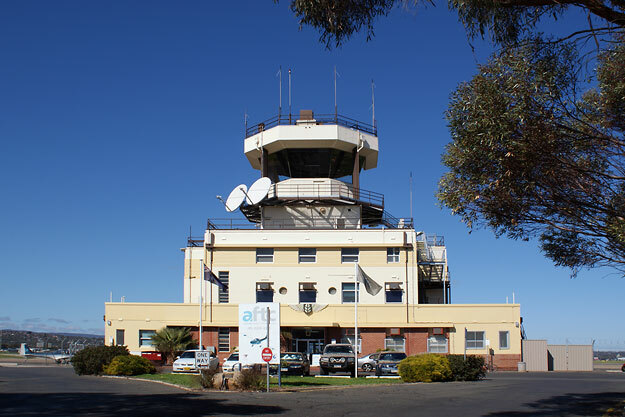 DCA then took over control of Parafield Aeradio and in 1941, aeradio control equipment was transferred to the new tower in the level below the top aerodrome control section. Kingsley AR7 receivers were added later and wired in around 1945 by Eric Manoel and Lloyd Butler from the PMG Dept. Photo 10 shows the Aeradio control desks with the AWA C2869 receivers and Kingsley AR7 receivers mounted in racks. The station AWA Bellini Tosi DF Receiver, a bit difficult to see, is in the lower background. More detail of the AR7, as used by DCA, is given in Reference 11. Aeradio Operators (later called Communications Officers) that were recorded in 1945 were George Anderson (VK5GA) who was in charge, Clarrie Castle (VK5KL), Frank Brandon (VK5FB), and Jack Coulter (VK5JD)]. Commencing in 1943, transmitters made by Airaco in USA were added to Australian main aerodromes. At Parafield, the Airaco unit was installed at the Transmitting Station by staff from the PMG Dept. The PMG Installation team were probably led by Cliff Moule who was also involved with a number of these Airaco transmitter installations at regional aerodromes. 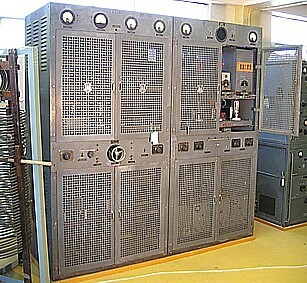 The transmitter, designated 500C, had two 500 watt RF units fed by a central power unit. One unit could operate in the region of 275 to 400 kHz for use as a homer beacon which was keyed with an ident using Modulated Continuous Wave (MCW). In the case of Parafield, the ident was AD in morse code and the carrier frequency was 365 kHz (later changed to 275 kHz). The ident could be interrupted by voice instructions to aircraft via landline from the Aerodrome Controller located at the top level of the Control Tower. Apart from being a homer beacon (or Non Directional Beacon NDB), the 500C transmitter also formed part of the aerodrome control. The Homer Beacon RF unit used a 40 metre guyed vertical radiator made from steel bore casing with its base insulated from a radial earth mat and connected via a large loading coil. The radiator was fed from the transmitter via underground coaxial cable. The second RF unit in the Airaco transmitter could operate within the range of 2.5 to 15 MHz on CW. This was used for point-to-point communication and was connected via landline to the aeradio operator. By 1947, DCA had assembled enough technical staff to carry out their own radio installations in the South Australian region. The first of these were previous aeradio operators Eric Halliday and Dudley Wilkinson. 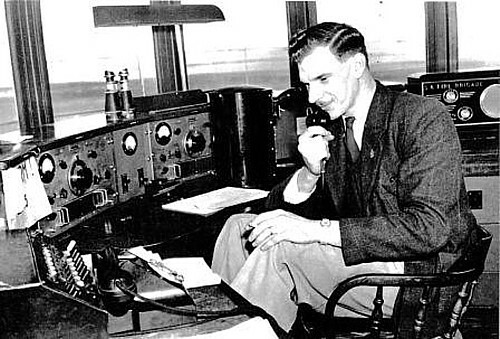 The use of VHF communication between Parafield and aircraft was commenced in 1949. Transmitters type BC625 and Receivers type BC624 (Photos 12 & 13) were extracted from aircraft transceivers Type SCR522, mounted in racks, and installed in the Parafield Tower building. One pair, locked on 118.1 MHz, were connected to the aerodrome control tower for aerodrome control. The second pair, on 119.7 MHz, were connected to Area Control (the approach channel). The third pair, on 122.1 MHz, were connected to Aeradio (The En-Route channel). Difficulty was experienced with shielding of the En-Route signals in the easterly direction by the Adelaide Hills. By 1951, a VHF repeater had been installed at the higher location of Summertown to fix the problem. The addition of VHF was nesessary as more aircraft were using VHF and VHF had become the normal means of communication. The HF channels and the MF channel on 325 kHz were still available as a back up. 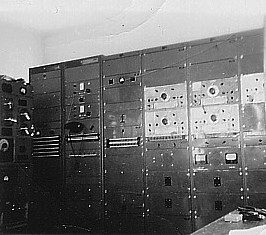 During the years of 1951 to 1953, a programme was carried out of updating and rearranging the aeradio equipment in the Tower building. This was carried out by the Radio Workshop staff led by Lloyd Butler. New control racks and a new aeradio operating console were built in the workshop and the new console was installed in an isolated room allocated for aeradio. The AR7 receivers were replaced by the new crystal locked DCA R20 HF receivers (Photo 14) in racks and located in another room allocated for receivers. Further down the track, the VHF BC624 receivers were replaced by DCA R30 VHF receivers. The R30 and R20 receivers were an AWA product built to DCA specifications. The 33 MHz Radio Range was a system based on a development by Lorenz in Germany. The system was put into operational service at a number of key Australian aerodromes, including Parafield, in 1939. Operation is as follows: The carrier frequency, fed to the antenna, was amplitude modulated by a 1150 Hz tone. Reflectors on either side of the antenna were keyed with relays, one for a period of 7/8 of a second and the other for 1/8 of a second, giving Morse E (.) and T (-) signals. As a result, two distinctive field patterns were produced in the horizontal plane. Along the axis at right angles to the aerials, the dot and dash field patterns overlapped and the signals merged into a continuous tone to form the beam. The transmitter was manufactured by AWA with an output of several hundred watts. 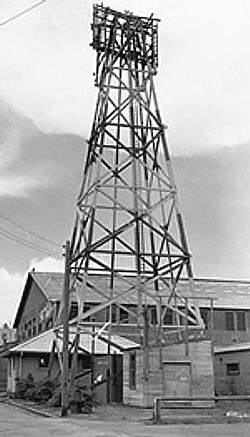 The antenna was mounted on a wooden tower similar to the one illustrated in photo 15. The wooden tower had replaced an original steel one which when initially installed had caused distortion of the beam. The tower can also be seen in photo 1 towards the rear of the aerodrome buildings. More detail of the 33 MHz radio Range can be found in Reference 6. Marker Beacons were installed at airports where the Radio Range was used as an approach aid and Parafield was equipped with a low power boundary marker beacon operating on 38 MHz with the commencement of the 33 MHz Radio Range. The beacon was originally an AWA 25 watt unit located in a hut slightly west of the radio range tower. In the 1940s, the unit was replaced with a 10 watt British Ministry type unit. The transmitter was probably modulated with an interrupted 1700 Hz tone. The radiation was horizontally polarised using horizonatal crossed dipoles, providing a narrow beam in the vertical plane. As the radio range was polarised in the vertical plane, separate receivers in the receiving aircraft were used for the two systems of Radio Range and Marker Beacon. The 33 MHz Radio Ranges were removed from service in April 1953 with the commissioning of the 112 MHz Visual Aural Range (VAR) network. However for a time, both systems were operational in conjunction with Parafield. The marker beacon was also taken out of service when the 33 mHz Radio Range was de-commissioned. The VAR was initially installed at Parafield by staff of the Transmission Section of the PMG Department in 1946-47 and tested to a power on state. It was located on the northern side of the aerodrome boundary on the opposite side of Kings Road. Satisfactory field operation was not achieved at that site and in 1950, it was moved to the new West Beach airport site, which was then under construction. The VAR was made operational at West Beach in 1951 with John (Joe) Ward as duty technician . Referring to the extract from a 1952 ANFAC, on Parafield facilities (Fig. 1), both the 33 Mhz Radio Range and the VAR were operating at that time and available to aircraft. The VAR was quoted as a 10.1 miles location from Parafield, which of course was West Beach. Operation of the VAR system was as follows: The VAR provided two visual and two aural tracks. The visual tracks were set up on straight through directions with 180 degree separation or displaced according to operational requirements. These visual tracks were produced by the radiation of two overlapping patterns. One pattern was modulated by 150 Hz tone and the other by 90 Hz tone. The visual tracks were determined by the points of intersection of the two patterns. The strength of the two tones were equal at these points. The sectors were known as the blue sector where the 150 Hz tone predominates and the yellow sector where the 90 Hz tone predominates. On the instrument associated with the aircraft's receiving apparatus, a vertical pointer remained centred and indicated "on track" when the tones were of equal strength. If the aircraft deviated into the 150 Hz pattern, a proportionally large amount of 150 Hz tone was produced in the output of the receiver. This caused the vertical pointer to move into the blue sector of the indicator. Conversely if the aircraft moved into the 90 Hz sector this tone predominated and the pointer moved into the yellow sector. Like the visual tracks, the aural tracks were produced by the radiation of two overlapping patterns. The signal of the aural pattern was modulated by 1020 Hz tone. One pattern was keyed to the Morse Code letter A and the other to N. The two codes interlocked to give a constant 1020 Hz tone at the intersection of the two paths. When the aircraft was on the aural track, the pilot heard a constant tone. Deviation from the track resulted in a predominance of letter A on one side and N on the other. The tracks of the VAR were oriented so that the visual tracks were aligned along the major airways routes. Whilst the VAR initially operated in conjunction with Parafield as the main Adelaide airfield, it became part of the completed West Beach airport when West Beach was opened for domestic operations in February 1955. The VAR operated at West Beach until around 1976 when it was phased out by the Visual Omnidirectional Radio Range (VOR) that had become a world standard. Within the VHF range, the VOR receiver in the aircraft provides a bearing to, or from, the selected VOR station. The system operates for any angle, 360 degrees around the VOR station, in effect providing a track for any bearing relative to the station. No doubt, with the introduction of Satellites in Space and the Global Positing System (GPS), aeronautical navigation has somewhat changed. However VOR still exists. The Radio Communication and Navigation Facilities available to aircraft from Parafield, as at 1952, is summarised by the extract (Figure 1) from ANFAC (Airways Navigational Facilities), DCA booklet. Note the designations Kc and Mc. In those days, we talked about Cycles per Second, whereas now it is Hertz, kHz and MHz. Also 1952 preludes the Australian introduction of metric measurement and distance is quoted in miles. The DCA SA/NT Regional Radio Workshop developed from around 1947 with Eric Halliday in charge. By 1950, the Radio Workshop was made up of around 30 Radio Technicians and Senior Radio Technicians who constructed radio equipment and provided the staff to carry out installations in the SA/NT Region. Don Crowley became the Supervisor for a short time in 1950, followed by Lloyd Butler in March 1951, who continued until late 1953 when Eric returned. In those earlier years, the workshop operated at Parafield from one of the huts which had been vacated by the RAAF before 1945. In later years, the Radio Workshop moved to 98 Henley Beach road, Mile End, which had been previously used as the DCA regional headquarters. In 1947, DCA (through the Commonwealth Public Service Board) held their first Australian examinations for DCA Radio Technicians and Senior Radio Technicians. Resulting from qualification as Senior Technician, the following took up senior appointment or promotion in SA: Lloyd Butler, Don Crowley, Pat Giddings, Eric Halliday, Eric Manoel, Frank Partridge, and Dudley Wilkinson. Apart from the Radio Workshop leading positions mentioned before, Dudley Wilkinson supervised the radio maintenance staff and Eric Manoel established the Technicians Training School. By around 1950, The technical staff had stabilised to about 30 Tehnicians and Senior Technicians, about two thirds appointed permanent in the Commonwealth Public Service, and about a third on a continuing temporary basis (called Exempt Technicians). assembled and wired by Radio Workshops. panels fronting the receiver Codans. The workshop became involved in a diverse range of work. It assembled and wired up racks of radio and control equipment, assembled and wired up rack mounted panel and chassis units and assembled control consoles for aeradio stations. It refurbished transmitters and receivers and in the case of the Kingsley AR7, the receivers were completely stripped down, chassis re-cadmium plated, and then re-wired. Carrier Operated Device Anti-noise (Codan) units for the AR7 and the BC624 receivers, were also constructed by the workshop. Much of the assembly work by technical staff led to installation by the same staff at regional aerodromes. Special mention is made of the Codan units and their effect in reducing the nervous strain on aeradio operators. Before these were introduced, the operators were required to continuously monitor a number of HF channels and an LF/MF channel, all blasting out their background noise, sometimes with heavy static which was quite overwhelming. The Codan units, with circuitry first developed by AWA engineer James Rudd, completely shut down the receivers so that there was complete quiet (with no noise) in the absence of any carrier signal. A receiver only opened when a signal carrier was received. Indeed, the Codan was a great improvement to aeradio operations. The original Codans were made in rack mounted units, as attachments to the receivers. In the later DCA R20 and R30 receivers, the Codan circuitry was incorporated within the receiver units. Right up to 1954, the Regional Radio Workshop was kept fully engaged addressing the continual change of the airways technology and the need to build and instal new equipment. But around 1954, the Federal Government put some restrictions on Government Department spending, including within DCA. This initially reflected on the quantity of work requests received by the Radio Workshops and the full engagement of the technical staff. Ultimately, the Exempt Technicians were all discharged, reducing the staff by about one third. Also there were several Supervising Technician positions in Regional Planning, Regional Maintenance, and the workshop one, which were downgraded or abolished. John Langman, Frank Rouseau, ? Jack Marler, Roger Opie, Len Clifford, Paul Muscat. The Engineering and technical administration for the SA/NT division of DCA was divided into two groups with the radio technical staff divided between workshops/Installation and ongoing radio maintenance. Regional aerodromes had a single resident senior radio technician for maintenance and a group maintained the radio facilities at Parafield, initially led by Ted Stephenson. At Parafield, the group were responsible for maintaining aeradio facilities and other radio systems in the tower, the transmitter station and the radio navigation systems. As West Beach Airport was developed, their maintenance extended into the operational West Beach radio facilities. All this gear has always been unattended and if something ceased to operate outside of normal daytime working hours, someone in the group was called out. One night (or it may have been early morning), an aeradio transmit channel failed and a technician was called out. Walking through the door of the transmitter station, he was confronted with the still smoldering embers inside the steel cabinet of an AT8 transmitter. There must have been a fierce fire in there, probably primed by the oil packed in the high voltage filter capacitors and possibly an oil filled transformer. The heat actually melted the glass envelope of the large transmitting valve and being evacuated, its glass wrapped around the elements inside the valve. All of the transmitter cabinet wiring and the associated components were completely gutted. It is interesting that the fire was contained to within the steel cabinet of the AT8 and the rest of the transmitters in the building were still working. However the building walls, its ceiling, and the cabinets of the other transmitters in the building, were plastered with black soot. Quite a job remained for the painters to repair the walls and for the technicians to clean up the cabinets of the other transmitters. Eric Manoel first set up the DCA Technician's Training School around 1953 in one of the Parafield huts previously occupied by the RAAF. Five year courses were established similar to the five year structure, long established by the PMG for their Technicians-in-Training. The first training group commenced their first year in 1952 with the first two years in the PMG school leading on to later years in the DCA school. Eric, as Principal of the school, eventually moved on to become Head of the Kilkenny Technical College. Eric was succeeded by Eric Haliday and later Derrick Howarth, Other early Instructors included Fred Cuthbert, Les Nippress, and Lloyd Butler. In 1954, the school moved from Parafield to one floor of Simpson's Building in Gawler Place, Adelaide. At that time, the Building was already the home of the PMG Technician's Training School. Further down the track, the DCA school eventually moved to the West Beach Airport. Government Aircraft Factories (GAF) was the name of an aircraft manufacturer owned by the Government of Australia and based at Fishermans Bend, a suburb of Melbourne in Victoria. It had its origins in the lead-up to World War II, during which it was known as the Department of Aircraft Production (DAP). The two large hangers were erected by DAP at Parafield in the years approaching WW2 to carry out major overhauls of aircraft for the RAAF and the other services. The two large hangers are shown on the left in Photo 18. According to Geoff Goodall (Ref. 8), DAP also occupied the fhird hanger along from the left. The work for the RAAF and the RAN by DAP continued well into the 1970's. 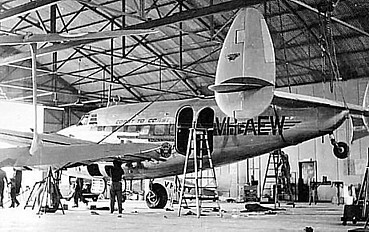 A great deal of work was carried out refurbishing RAAF C47 Dakotas, virtually stripping them right down in the process. Many former USAAF and RAAF aircraft were converted back to DC-3 passenger airliners following WW2, with these aircraft entering Australian domestic airline service with ANA and TAA. The interior of their fuselage was lined, and passenger seats and doors were added. During the 1950s, DAP gave the DCA Radio Workshop assistance by making very accurately fitting aluminium panels, chassis' and covers for the rack and panel radio equipment, which the Radio Workshop constructed. Photo 18 - Department of Aircraft Production (DAP) 1965. The DAP hangers Hangers are the two large ones on the left. Guinea Airways originally started around 1926 under the name of Guinea Gold but were registered as Guinea Airways Ltd on November 7, 1927. They operated in New Guinea, mainly transporting heavy machinery and other bulky loads, such as cars, tractors, and farm animals. They operated until 1942 when Japanese fighters destroyed much of their aircraft fleet. Later during that period, they took over Holden's Air Transport Services and carried a large number of passengers. In September 1936, Guinea Airways imported a twin engined Lockheed 10 passenger aircraft, and in 1937, they imported two more of the same type. The Lockheed aircraft was well known by its twin tails. Based at Parafield with their Lockheed 10s, Guinea Airways started an Adelaide to Darwin weekly service. In May 1938, the company obtained the Government airmail contract for the Adelaide-Darwin route. 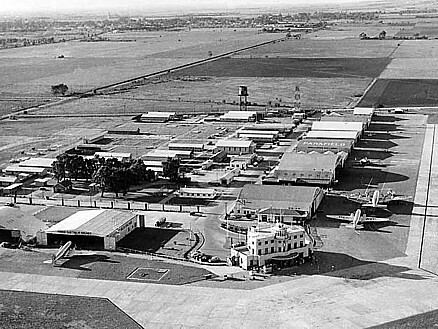 The Guinea Airways hanger, to the right of the Tower building and its reception area, stood out in the line of Parafield hangers. Other hangers to the right of the Tower building included the Royal Aero Club, Rossair, and Robbies Aerial Services. The flights on the Darwin run had their moments. The two engined Lockheed 10 did its job but was well known as being unable to maintain continuous flight on one engine. One day, Eric Halliday was a passenger in the aircraft taking off from Alice Springs. For take off, the aircraft needed all its power but one engine suddenly cut out. In the Lockheed 10, the passengers had full view of the crew, and according to Eric, there were many hands of the pilot and co-pilot, flying around at great pace in the cockpit. As luck would have it (or perhaps more accurately because of their skill), the engine re-started and the aircraft continued on its take off path. Another Lockheed 10 story came from Lloyd Butler. It was his first flight on the Lockheed and in fact, first on any aircraft. They landed at Mt Eba to refuel and took off again on the way to Oodnadatta. The passengers observed oil gushing out of one wing, so they thought they should advise the pilot. He took one look from the cockpit, banked the aircraft, and returned to Mt. Eba. The bearded chap, who refuelled at Mt Eba, had forgotten to replace the oil cap. So with the oil cap back in place, they eventually took off again and went on their way to Oodnadatta and Alice Springs, as it turned out, a pretty rough journey skirting the edge of an electrical storm. For a short time in late 1930's, Guinea Airways operated between Adelaide and Sydney, but this route was abandoned when their Darwin service increased. On Saturday March 5, 1938, 14 year old Lloyd Butler was witness to an event in his home town of Murray Bridge. With a parachute flare dropped from the plane and the headlights of 150 motor cars to guide him, pilot H. Hughes landed a Guinea Airways Lockheed Electra 10 passenger plane on the local race course at 7.45pm that night. The plane, which was on its way to Parafield from Sydney, developed engine trouble after having left Mildura. Rather than risk crossing the Adelaide Hills on one engine, pilot Hughes decided to land at Murray Bridge. The pilot had been in radio communication with Parafield all the way from Mildura. He circled Murray Bridge for 15 minutes whilst getting complete directions from Parafield officials on the location of the racecourse. In the meantime, the people of Murray Bridge had not been idle. Their local police had intercepted every motorist they could see, and headed a procession to the racecourse. Other motorists, who had been watching the plane circling, joined in the procession to the racecourse where they all formed a giant circle around the centre of the course, headlights pointing inwards. Further passenger aircraft purchased by Guinea Airways were the Lockheed 14. The first of these was registered as VH-ABI and it arrived at Parafield in May 1938 for use on the Adelaide-Darwin route. Unfortunately, in January 1939, it crashed beyond repair in the Katherine River on take-off, killing all of the three crew and its single passenger. The next Lockheed 14 aircraft arrived at Parafield Airport in June 1940, intended also for use on the Adelaide-Darwin route. The aircraft, stationed at Parafield, was originally registered as VH-ADW, but this was changed to VH-AEW. The designation VH-AEW became an icon for PMG and DCA passengers, who regularly travelled the Adelaide Darwin route during the wartime years. It operated on that route until 1945 when the Australian Airlines Commission restricted the airline to fly in S.A. and N.T. using only Douglas DC.3 aircraft. 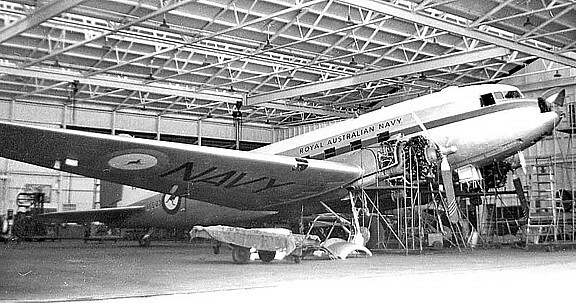 VH-AEW was taken out of service in 1951. Photo 21 - Guinea Airways Lockheed 14 VH-AEW. operated the Parafield to Darwin route for many years. Captain "Nobby" Buckley is remembered for his service, particularly flying the Lockheed aircraft. He joined Guinea Airways in 1937, and was Chief Pilot with Guinea Airways, and its subsequent namesakes, from 1946 to 1960. On September 9, 1946, Federal Government owned Trans Australia Airlines (TAA) commenced operations. The Adelaide-Darwin airmail contract was awarded to TAA with the first flight occurring on November 1, 1947. But on that first day, Guinea Airways also flew on the same Adelaide-Darwin route and this was repeated for some days until November 7. Affected by the competition and the loss of the airmail contract, Guinea Airways then dropped out from the route. At Tennant Creek during that first week, observers were amazed to see the two aircraft land and take off at close to the same times. .
Ansett Transport Industries Ltd began flights into Parafield in 1937. It purchased Guinea Airways in 1959 and in January 1960, Guinea Airways became Airlines of South Australia (ASA) and operated over regional South Australia. In November 1968, ASA was renamed Ansett Airlines of SA (AASA). The company ceased operation in1986. A more recent photo 22, from the air, shows Parafield Aerodrome with two sets of parallel runways. But the landing field didn't always have runways. In the earlier days it was an open field to provide for many of the earlier small aircraft that had rear skids which ran in the soft soil on landing. A few changes to the Parafield Control Tower took place with the progression of years. The building originally had an all-glass Control Tower cab on the roof, as shown in Photo 8. But this was replaced by the present octagonal cab which was commissioned in October 1981. Photo 23, taken in 2008, shows the modified building. Parafield Airport is owned by Government of Australia and is leased to, and managed independently, by Parafield Airport Ltd, a subsidiary of Adelaide Airport Ltd. It is now currently used for pilot training and general aviation aircraft. The airport is home to the Parafield Aviation campus of TAFE South Australia and Flight Training Adelaide (FTA). The airport hosts a Classic Jets Fighter Museum and historic aircraft displays. The museum now houses an authentic Wirraway. "With 250,000 flight movements a year, Parafield is one of the busiest general airports in the country, providing pilot training for airlines that include Virgin and Cathay Pacific. It supports almost 2000 fulltime jobs and in the next twenty years is expected to support a thousand more while tipping about $300m into the economy." The article describes some of the early general history of Parafield Airport with particular reference to its radio communications and radio navigation facilities. Some of the well known operational sections on site have been briefly discussed. Parafield commenced as Adelaide Airport in 1927, continuing until 1955 when West Beach became Adelaide Airport. The development of radio facilities at Parafield mirrors much of the development of radio in civil aviation throughout Australia. In earlier days there was little ground control of aircraft in flight and in the 1929 Air Race, members of the RAAF Reserve, with amateur radio operating experience, were engaged to provide radio communication. On site radio communication, installed by AWA, was first provided at Parafield in 1937. The Department of Civil Aviation commenced in 1938 and between 1939 and 1947, the PMG's Department provided technical assistance with radio installations. The first Radio Range was installed in 1937 and made operational in 1939. By 1947, the DCA were able to provide their own radio technical operations. (18) The great 1929 Air Race - "OTN" February 1989.